CWH3 solid walnut handle with a 3 way brass chuck which holds Warren's small 5/16 inch blades 1/2 inch blades and their hand-forged chisels. 6SBL blade pack of 6 small high carbon steel detail blades 5/16 inch wide x .030 thick. 1 -LD2 1/2 inch wide x .050 thick heavy duty blade. Two hand forged chisels: 1 PTV-1 1/4 inch cut 75 degree Vee. 1 LBG -#7 sweep gouge 5/16 inch cut. Vinyl covered steel box with piano hinges. All blades and chisels are RAZOR-SHARP!!! MADE IN THE USA!! 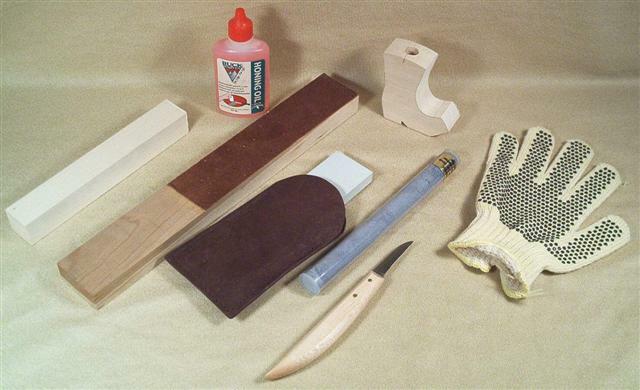 I am a newbie carver but they are a nice set of knives. The blades sometimes loosen up and fall out or fall down inside. Would be nice if the blade was gripped more securely. Over all I like them and will continue using them.